My current research project, “A New Deal for Quilts,” explores intersections of gender, poverty, race, craft, and politics in the New Deal era through the lens of quilts and quiltmaking. By the time the Roosevelt Administration began combatting the Great Depression, the quilt had become an emblem of how to lift one’s family out of poverty, piece by piece. 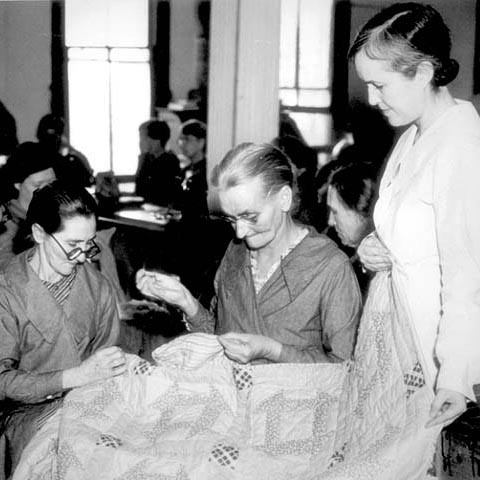 I argue that federal programs—including the Farm Security Administration, the Works Progress Administration, the Federal Arts Program, and the Tennessee Valley Authority—embraced quilts as a political tool to demonstrate the efficacy of these programs, show women how they could contribute to their families’ betterment, and symbolically draw on myths of colonial era fortitude and self-sufficiency as a means of overcoming poverty. Similarly, quiltmakers during this era used quilts to express their frustrations with the downturn and to feel empowered, despite precarious financial positions. These ideas stemmed from the nostalgia-fueled Colonial Revival of the late 19th and early 20th centuries, which celebrated a romanticized version of the experiences of colonial-era Americans, while altering the values with which Americans tried to live, as many looked longingly to the imagined simplicity of the pre-industrial past despite the increasingly modernizing society.